A vaporizer is a small appliance that adds moisture to the air by heating water into a hot mist. A steam vaporizer should be kept at least 4 feet from you. A vaporizer is often compared to humidifiers, which are similar types of devices that add moisture to the air. 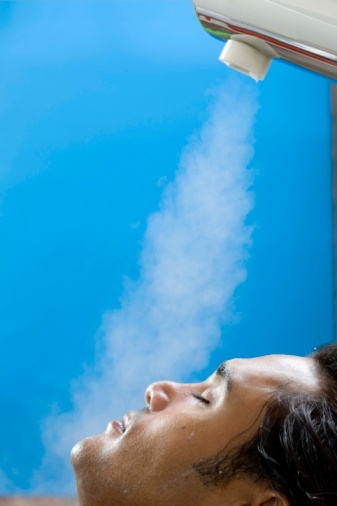 However, humidifiers do not heat the water, which is why they are sometimes referred to as "cool mist" devices. There are many reasons to sleep with a vaporizer, from simple comfort to remedying an ailment. There are many benefits to sleeping with a vaporizer. Pneumonia is caused when bacteria, viruses or other irritants cause inflammation in the lungs. Sleeping with a vaporizer is recommended as a proactive measure for people at risk of pneumonia, including people with HIV or those undergoing chemotherapy treatments, or people who are elderly. A vaporizer, as well as taking warm showers, can help thin out secretions in the lungs. Pneumonia can be a serious illness, so other precautions must be taken in addition to sleeping with cleaner air. If your child is coughing, he or she may have croup. Croup is a viral infection that affects young children. The condition causes swelling of the vocal cords, resulting in a barking cough. If your infant or child has come down with croup, you may want to purchase a vaporizer. A vaporizer uses warm air, so your child should not breathe directly from it; however, it is safe and very effective to leave the vaporizer on throughout the night in your child's room. According to the National Heart, Lung and Blood Institute, the best way to treat a cough is to treat its cause. Sometimes, though, the cause is unknown; instead, you can take measures to relieve the cough itself. Sleeping with a vaporizer can relieve an irritated throat as well as loosen mucus. Coughing up mucus, although it doesn't sound so pretty, is an important step in the recovery from a cough. The U.S. Consumer Product Safety Commission suggests the use of clean-mist humidifiers and vaporizers to reduce indoor levels of biological irritants such as fungi and pollen. However, the organization also warns that poorly maintained vaporizer units can also cause irritation; be sure to clean and replace the water in your vaporizer according to the manufacturer's recommendations. What Can Make You Feel Dizzy in Your House?